The Complete Tradesman redresses the relative paucity of studies on the history of retailing before 1800. Based upon extensive research into diverse trade sources, Cox takes issue with the surprisingly resilient stereotype of the 'dull' and 'out of date' shopkeeper in the early modern period, showing that the retailing sector was well adapted to the social and economic needs of the day and quick to exploit new opportunities. Chapters cover not only distribution, shop design, customer relations and networks between tradesmen, but also attitudes to retailing, official controls, and the response to novelty. By throwing light on subjects hitherto overlooked and challenging existing whiggish preoccupations with progress towards modern retailing systems, this study signals a new approach to the history of retailing. The focus is placed on assessing how far tradesmen, especially shopkeepers, satisfied and stimulated contemporary desires for consumer goods. Contents: Introduction; ’Consumption is the sole end and purpose of all production’: the current debate on consumption and retailing; A ’dangerous Consequence if the Trade of a Nation run into over-much shop-keeping’: contemporary thoughts on the retail sector, 1550-1800; Too great numbers of shopkeepers in this kingdom’: access to consumer goods, 1550-1800; ’Their shops are Dens, the buyer is their prey’: shop design and sale techniques, Nancy Cox and Claire Walsh; ’For a tradesman...his customers are to be his idols’: the relationship between the retailer and his customers; ’It is the most dangerous state of life that a man can live in’: managing credit; ’A settled little society of trading people who understand business’: networking among retailing tradesmen; ’I know not yet what that is, and am ashamed to ask’: accommodating innovation and novelty; Conclusion; Bibliography; Index. Dr Nancy Cox is Honorary Research Fellow and Academic Editor/Dictionary Project at the University of Wolverhampton, UK. 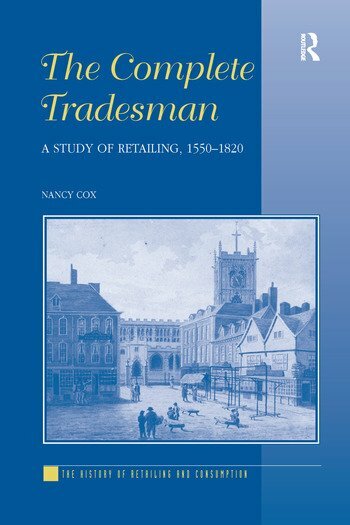 Previous books for Ashgate include The Complete Tradesman: A Study of Retailing, 1550-1820 and, with Karin Dannehl, Perceptions of Retailing in Early Modern England.